This landscape of ‘Les Vessenots,’ on the outskirts of Auvers, shows a group of old country cottages placed just below a raised horizon; further down, wheat fields stretch to the bottom of the canvas, broken only by a few swaying trees. The narrow colour range—mainly bright greens and yellows—and the nervous, agitated brushstrokes following a repetitive, undulating rhythm, are characteristic of the artist’s work in his final period. 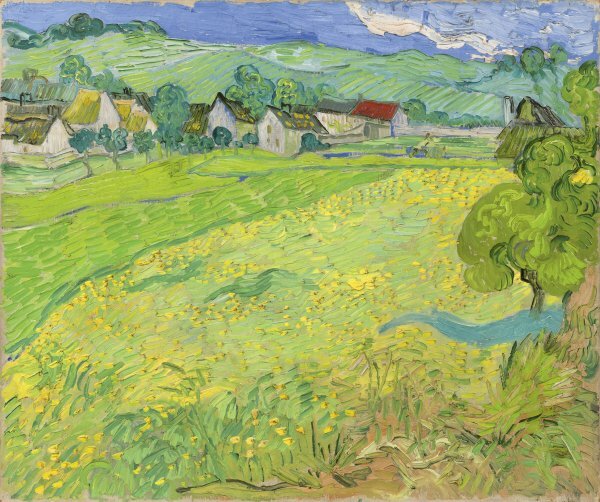 Van Gogh painted a large number of landscapes in the weeks before his death, always working outdoors. By that time, he was prey to all manner of conflicting moods: the vast expanses of fertile cropland gave him a sense of freedom, but at the same time intensified the feeling of melancholy and loneliness which would eventually lead to his suicide. On 20 May 1890 Vincent van Gogh left Paris for Auvers-sur-Oise, a small village thirty-five kilometres north of Paris where other artists like Charles Daubigny and Paul Cézanne had sojourned before him and the place of residence of Doctor Paul-Ferdinand Gachet, the physician and art collector to whom Theo van Gogh entrusted the care of his brother Vincent’s health at the recommendation of Camille Pissarro. Despite lasting scarcely two months, the Auvers period was extremely productive. During what would the last weeks of his life, Vincent painted a few portraits and numerous landscapes including “Les Vessenots, ” the area of Auvers where Doctor Gachet, the first owner of the painting, lived.